. Pilgrimages in Edo - Tokyo - Introduction . This pilgrimage has started in 1981. 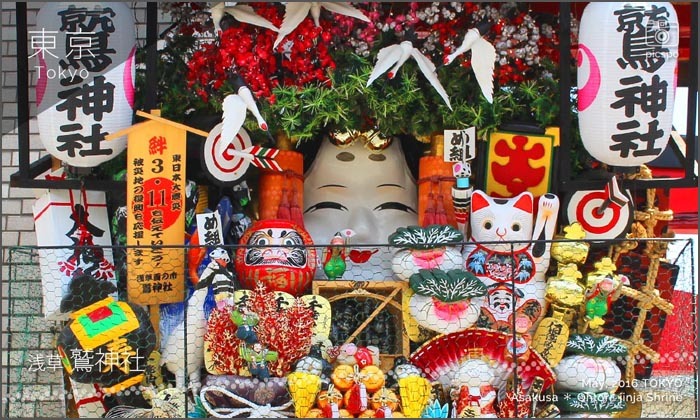 There is a deity in each Shinto Shrine for a special purpose and wish. Shitamachi literally means "downtown" and is the place to experience a taste of the old town Tokyo atmosphere that existed before the economic miracle of the 1970's and 80's really took hold. The most famous district of Shitamachi is Asakusa. At its heart you find Senso-ji Temple, best known for the giant red lantern situated at the entrance. 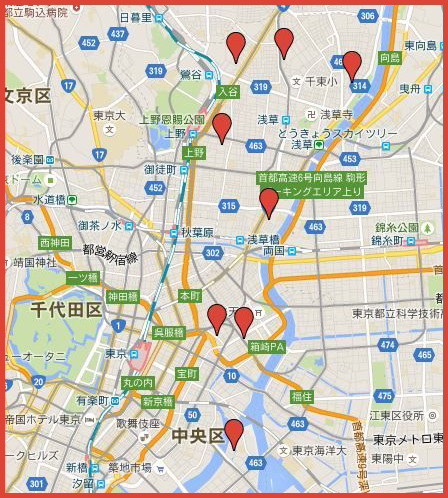 This is a great place to start any exploration of Tokyo. 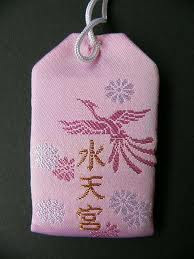 amulets for all purposes at the Tori no Ichi Market.
. 酉の市 Tori no Ichi Markets in Edo . 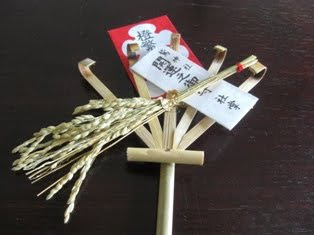 It contains the rake for farmers, a written amulet and an ear of rice, with the wish for a good harvest in the coming year. It is also good for business and a happy family.
. 今戸神社 Imado Jinja . Famous for the story of the manekineko　招き猫 "Beckoning Cat"
The temple used to be called 第六天神宮 Dairokuten Jingu, and was renamed in 1873 to 榊神社 Sakaki Jinja.
. Dairokuten Ma-O 第六天魔王 . The Deity of Fertility in enshrined here. 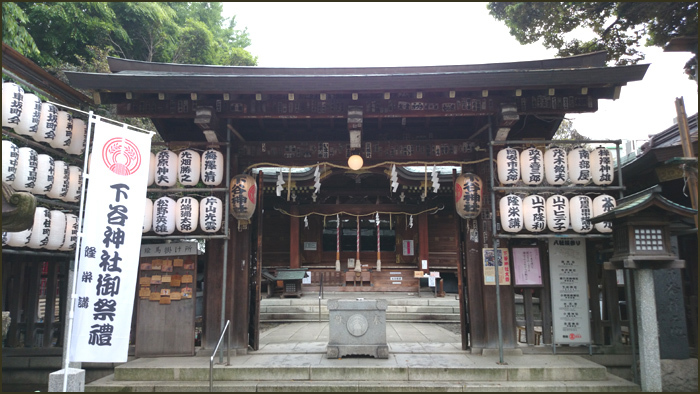 The Shrine was founded in 730 in Ueno park, and moved to another place in 1672. 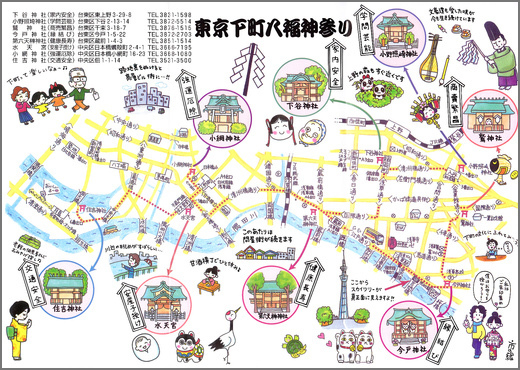 The final location to Higashi Ueno was done in 1703. The main event is the Grand Annual Festival, Reitaisai.
. Onoterusaki jinja 小野照崎神社 .
. Suitengu 水天宮 Shrine for the Water God . A long time ago, the monk 恵心僧都 源信 Eshin Sozu Genshin Eshin Sōzu Genshin lived here in a hermitage, worshipping the Buddhist goddesses Kannon and Benzaiten. It is not known, when exactly the hermitage was built, but it is assumed that the monk lived here about 1000 years ago. As a plague spread here in 1466, an old net-weaver came here and brought rice-ears that entangled in one of his nets as offering and decided to stay for a few days. 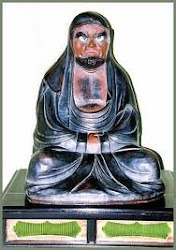 Then, one night, Eshin Sōzu appeared to the abbot of temple in a dream and told him, that this old man in fact was the god Inari and that the plague could be taken away if they worshipped him adequately. The next day, the old man was gone. However, the abbot remembered the advice and prayed to the god – which he now called Koami Inari Daimyōjin (Inari of the small net) – day and night. After a little while the plague was gone and the people could live in peace again. 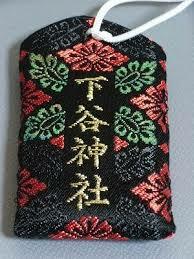 The overlord the region, Ōta no Dōkan, also heard of this miracle and donated a part of his fiefdom to shrine. At the end of the 16th Century then, the area around the shrine was also named Koami and the shrine itself was beginning to be worshipped as a tutelary god. In the Meiji-period (1868-1912) the state pursued a separation of Shinto and Buddhism, which both had moulded into a syncretic belief during the prior one-thousand years, and so the Koami Inari Shrine was officially registered as a shinto village shrine. The building as we can see it today was built in the 1920ies under the direction of Naitō Komasaburō, who also assisted the building of the Meiji-Shrine. Spared from the destruction of World War II, the shrine nowadays is the only wooden building made out of cypress wood in Nihonbashi. 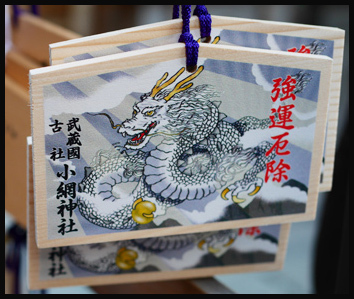 The wooden carvings of two dragons (one ascending, the other one descending) on the porch roof of the main hall symbolize luck and the shrine – now simply called Koami Shrine – stays an important cultural heritage, as which it is registered in the Chūō-district. Having been spared from destruction and continuously being linked to health and safety the goddess of the shrine is seen as a god of luck. For instance, all the sons of the families who lived in the shrine, returned home safely from World War II. The shrine also survived the numerous bombings of Tokyo in 1945 and did not – like so many others did unfortunately – burn down completely. However, the building was destroyed once during the Great Kantō Earthquake in 1923, although the abbot of the shrine was able to secure most parts of the sanctuary by bringing them to Shin-ohashi. It is also said, that those people who sought shelter there, have survived the aftermath of the earthquake. At First the goddess Benzaiten was honoured in the Manpukuji temple. Then, as the Meiji-government sought to separate Buddhism from Shintoism and installed the latter as a state religion, the Buddhist temple was destroyed and the goddess Benzaiten was transferred to this shrine in 1869. The image here shows the goddess Benzaiten sitting in a boat. Every year on October 28th a festivity is celebrated in honour of the goddess, where the sacrificial offerings, which are piled up in front of the altar, later on are raffled to the visitors. Besides that, there is also a small well (named Zeni-arai-no-i), whose water is said to have the power to multiply the money that is washed with its water. The carving of a dragon is very famous. 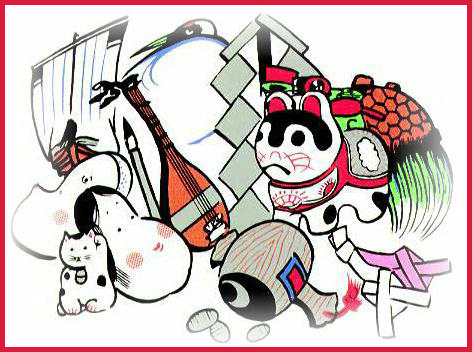 the temples and shrines of the seven gods of luck in Nihonbashi from January 1th to 7th. In our shrine we worship the gods Fukurokuju and Benzaiten, which are said to ward of the evil and shape our fate positively. 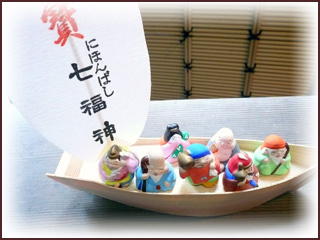 On this occasion we sell popular images of the gods of luck, as well as charms in the form of miniature ships. 息長足姫命 Okinagatarashi Hime no Mikoto .
. Sumiyoshi Shrines of Japan 住吉神社 . 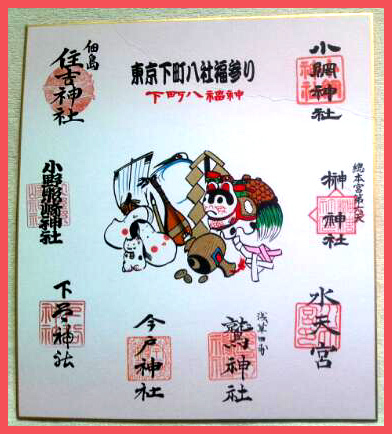 At the end of the pilgrimage, you get a board with eight stamps.
. Shichifukujin 七福神 Seven Gods of Good Luck .
. - - - - - . 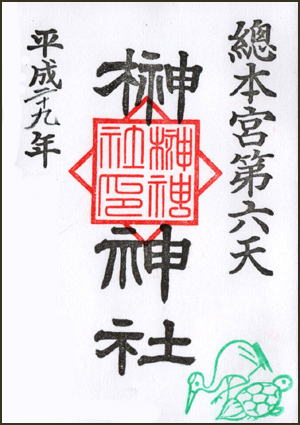 kami　神　Shinto deities - LIST . - - - - - .